The Green Bay Packers faced their season-opening game on September 7, 1980 with some trepidation regarding the offense. The Packers had not scored a touchdown in their last three preseason games and a total of 17 points overall. Furthermore, there had been rumors in the media during the week leading up to the game that there was a great deal of dissension on the team. Entering his sixth season, there was talk that Head Coach Bart Starr’s job was in trouble. The Packers were coming off a 5-11 record in 1979 after having contended the year before. QB Lynn Dickey regained his starting job from David Whitehurst late in the season and still held it. He had an outstanding target to throw to in third-year WR James Lofton. RB Eddie Lee Ivery, the previous year’s first draft pick, was back after a knee injury suffered in the first game of ’79 had cost him virtually the entire season. The division-rival Chicago Bears were the opponents for the opening week. Coached by Neill Armstrong, the Bears had reached the playoffs as a 10-6 Wild Card team in 1979. The key to the offense was RB Walter Payton, who topped the NFC with 1610 rushing yards. QB Mike Phipps, a first-round disappointment with the Browns, had performed ably down the stretch. The defense, under the direction of defensive coordinator Buddy Ryan, was tough and well-balanced. There were 54,381 fans in attendance at Lambeau Field. Green Bay’s offense continued to misfire against the Bears but the defense rose to the occasion. Chicago took the lead in the first quarter with a 42-yard Bob Thomas field goal, but big plays by the defense in the second quarter not only kept the visitors from adding more points but allowed the Packers to move in front. Early in the second quarter the Bears advanced into Green Bay territory but LB Mike Hunt sacked Phipps, who fumbled. LB Mike Douglass recovered at his own 41. Once again the Bears moved into Green Bay’s side of the field but a Phipps pass intended for WR James Scott in the end zone was intercepted by DB Wylie Turner. The biggest defensive play occurred when the Bears passed up a field goal attempt with a fourth-and-one situation at the Green Bay 14. Walter Payton, running a sweep, was tossed for a ten-yard loss by a hard-charging CB Mike McCoy. Lynn Dickey then threw to James Lofton to move the Packers into scoring territory in the waning seconds. Chester Marcol, who had gotten Green Bay on the board earlier in the period with a field goal from 41 yards, kicked another of 46 yards as time expired to give the Packers a 6-3 lead at the half. The Bears did get another field goal from Thomas less than four minutes into the third quarter, this time from 34 yards, but that was it. The Bears again came up empty in Green Bay territory when McCoy picked off a Phipps pass at his 19 yard line. FS Johnny Gray intercepted another Phipps throw and returned it to midfield. With neither offense able to reach the end zone, the game remained tied at 6-6 after four quarters of play. The Bears had the first possession in overtime but again the scrappy Green Bay defense came through and they were forced to punt. A clipping penalty nullified a 16-yard return by WR Fred Nixon. Still, the Packers moved to the Chicago 17 in four plays highlighted by Dickey throwing to Lofton for a 32-yard gain. On the ensuing field goal attempt, Chicago DT Alan Page blocked the low kick but it bounced directly back to Marcol, who grabbed it in midair and ran around left end with no defenders between him and the goal line (pictured at top). Marcol’s astounding 25-yard run with the blocked kick gave Green Bay a 12-6 win at six minutes into the extra period. Chicago outgained the Packers (268 yards to 214) and had more first downs (18 to 12). The Bears also sacked Dickey four times. However, they turned the ball over four times to one suffered by Green Bay. Lynn Dickey completed 10 of 22 passes for 138 yards with no touchdowns and one intercepted. 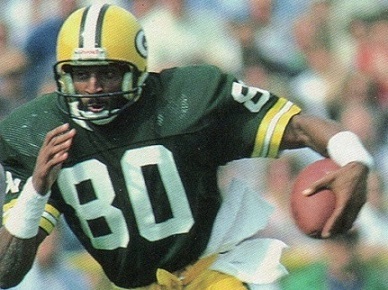 James Lofton (pictured below) caught 5 of those passes for 77 yards. Eddie Lee Ivery rushed for 73 yards on 15 carries. SS Steve Luke had a notable performance, accounting for 10 tackles, but the defense as a unit played very well. For the Bears, Walter Payton was held to 65 yards on 31 rushing attempts while gaining 38 more yards on four pass receptions. Mike Phipps was successful on 17 of 30 throws for 174 yards and no TDs but with three interceptions. Wide receivers Brian Baschnagel and James Scott each pulled in 5 passes, for 59 and 58 yards, respectively. The amazing overtime win did not mark an improvement in fortunes for the Packers. They lost their next three games on the way to a 5-10-1 record that placed them at the bottom of the NFC Central. Chicago also had a disappointing year, ending up third in the division at 7-9. 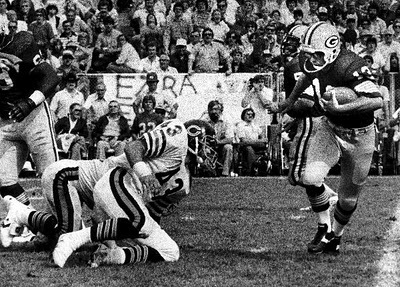 Chester Marcol, who scored a total of 521 points for Green Bay and twice led the league in scoring, failed to make it through the season with the Packers. He was waived after five games and picked up by the Houston Oilers in what was his final year in the NFL. Despite the team’s inconsistency and chronic problem with scoring points, Lynn Dickey went on to have a good year in many respects as he passed for 3529 yards and 15 touchdowns – although he also tossed 25 interceptions. James Lofton was chosen to the Pro Bowl for the second time after catching 71 passes for 1226 yards (17.3 avg.) with four TDs.